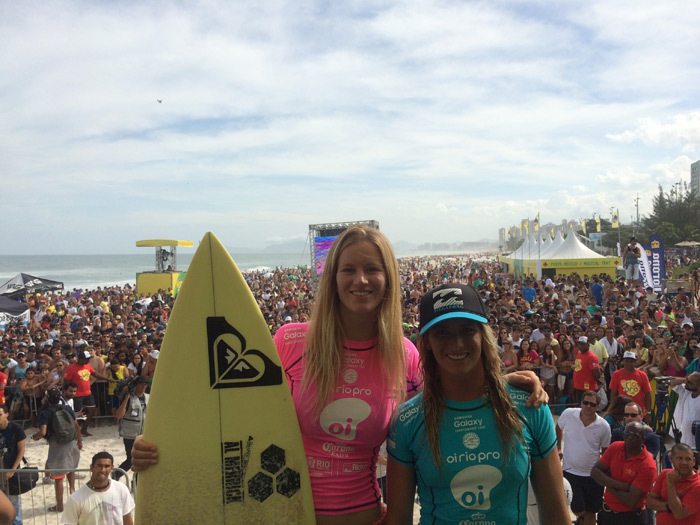 ROXY’s Bianca Buitendag has reached the Oi Rio Women’s Pro final in Brazil. This was the second CT final appearance for the talented South African rider after her 2014 match-up with reigning six-time World Champion and team mate Stephanie Gilmore (AUS) at the Roxy Pro Gold Coast. On her way to the final in Brazil against Courtney Conlogue, Bianca managed to take down current Samsung Galaxy Championship Tour leader Carissa Moore (HAW), Lakey Peterson (USA) and 2014 event winner Sally Fitzgibbons (AUS)! When asked what she attributed to her newfound mojo, Buitendag was humble. "I think God is my strength, whether I'm winning or losing," she said. "My mom and my auntie are here with me, and we are blessed beyond measure at the moment." 2015 is Bianca’s third year on tour and the result today shows steady improvement this season and sees her move up two places on the rankings to 9th thanks to 8,000 points. Next event will start on May 31st in Fiji.